There are hundreds of hotels on offer in Luang Prabang ranging from luxury five-star to those offering basic rooms with fans. Many of the Luang Prabang hotels are located in walking distance from the local attractions like the night market, temples and Royal Palace museum. 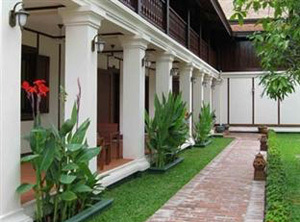 Some hotels are located outside of the downtown area and near other Luang Prabang attractions. Here is my selection of some of the more luxurious hotels in Luang Prabang as samples. More hotels will be added in the near future, please come back for updated list. Located in the heart of the city, Satri House hotel was designed with a style inspired by Lao culture. 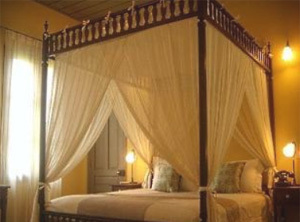 All the rooms are exquisitely decorated, large, clean, and fully equipped with modern amenities. Free use of bicycles is provided for all guests to make their exploration of this beautiful World Heritage town easier. Two outdoor pools in nice gardens provide a great place to relax after a day biking around town. Or give yourself a special treat at their in house spa. Friendly staff are readily available to make you feel welcome and at home, not to mention providing a delicious breakfast with lots if variety. 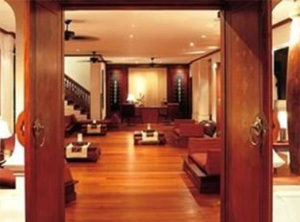 If you are looking for a touch of luxury in Luang Prabang you should consider this option. Click here to read reviews, find the best deal, and/or book the hotel. Phou Vao is the name of the hill where the La Residence Phou Vao Hotel is located. 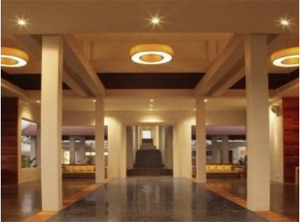 The hotel is one of the most luxurious hotels in Luang Prabang. It features the most stunning breathtaking views of the surrounding mountains. It is a bit tucked away from the town so it is quiet - excellent for guests who want a really relaxing place. For the convenience of its guests, the hotel has a shuttle service to and from the city. It is known for its French-influenced local cuisine, great wine and an open-air spa beside a water lily pool. Its fabulous location, lovely rooms, pampering spa, infinity pool with amazing views, great breakfast, and great staff make the La Residence Phou Vao unique and a great place for a treat. Click here to read reviews, find the best deal, and/or book the hotel. This newly built, Shinta Mani Hotel, is located on a hill top overlooking the city and valley. Staying here you will get the best you could expect, incredible views of Luang Prabang town and surroundings, infinity swimming pool on the rooftop with great view, delicious French breakfasts, comfortable and spacious guest rooms with large bath rooms, excellent service, and complimentary Wi-Fi in rooms. The hotel also provides a free shuttle service to and from the airport and well as town. The only downside is that it is a bit remote from town and the Mekong River, but this is compensated for by the free car service provided by the hotel that you can request whenever you want. Click here to read reviews, find the best deal, and/or book the hotel. This lovely brand new hotel is located in the town centre. It is tucked away on a small road right off the main road in a very safe and clean neighbourhood. The hotel is just the right size, not many rooms and all the rooms are excellent quality, spacious and elegant with polished wooden floors and lovely furnishings. Wi-Fi internet access is available in rooms and in common areas. The hotel is close to main attractions such as night market, morning market, National Museum and temples. All staff are friendly, helpful and they seem to have permanent smiles on their faces with friendly greetings. The hotel doesnt have a restaurant but freshly cooked breakfast is served every morning in the garden. Click here to read reviews, find the best deal, and/or book the hotel.